FatherGhonel had the most liked content! @[member='Rainchii'] Welcome to the community and glad to have you. See you in game. Welcome @[member='Driffic'] to the community. I have enjoyed our time playing and killing in PvP. See you in game. @[member='SergeantNomNomz'] If you go in thinking Skyrim then you might be upset. If you think MMO that is really kewl, then you will be fine. To many want it to be just like Skyrim. @[member='GCG00'] if you every jump from WOW to another MMO, check us out in ESO. It is a good time and we have an active guild. @[member='Yuki_Sorrelwood'] If you every branch into ESO look us up. Active community and good times. @[member='SuiicideMushroom'] I lived in bayern for 4 years and loved belgium. My favorite cigar is a Thompson London Club Special. It is a maduro but a faster smoke. Is best with a nice glass of Merlot. If you ever venture into ESO brother look me up. It is good to be young at heart. @[member='xRebbz'] If you every want to try ESO then look me up and I will invite you to the guild. We have a very active community. See you in game. @[member='SergeantNomNomz'] We have also breached out into Elder Scrolls Online and it is a very active guild. Come check us out. @[member='LbulletL'] welcome brother. I too use to play BF4 but am now playing ESO. If you are ever there look me up in game and I will add you to the guild. 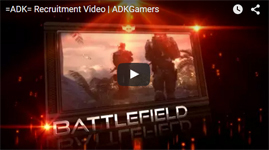 I would like to introduce myself to the ADK community!